Hello! I am Yiran Park, Los Angeles-based comic artist and illustrator. I am currently making a comic "Zombie Cat Invasion". It's a graphic novel about a cat named "Tiger" who turned into a zombie cat from an artificial virus created by mysterious cataliens from outer space. What do the cataliens want? Destroy Everything on Earth. My graphic novel will be uploaded on Line Webtoons starting March 2019, with the support of my patrons. My big plan is to finish Zombie Cat Invasion graphic novel in 2019, then print my own books. The book will be in approximately 290-pages, printed in Duo-tone of Black and Red offset printing. I currently work full-time as an illustrator and graphic novel artist. but it really depends on my readers. I wish to continue making comics and make this my career. If you want to support me financially, you can do so by becoming my patron. SO, HOW DO YOU BECOME MY PATRON? You pledge to donate a certain amount of money per month. And in return, I provide extra stuff to you, my amazing readers! How much you donate depends on which tier you choose from the two. I appreciate every bit of your support! 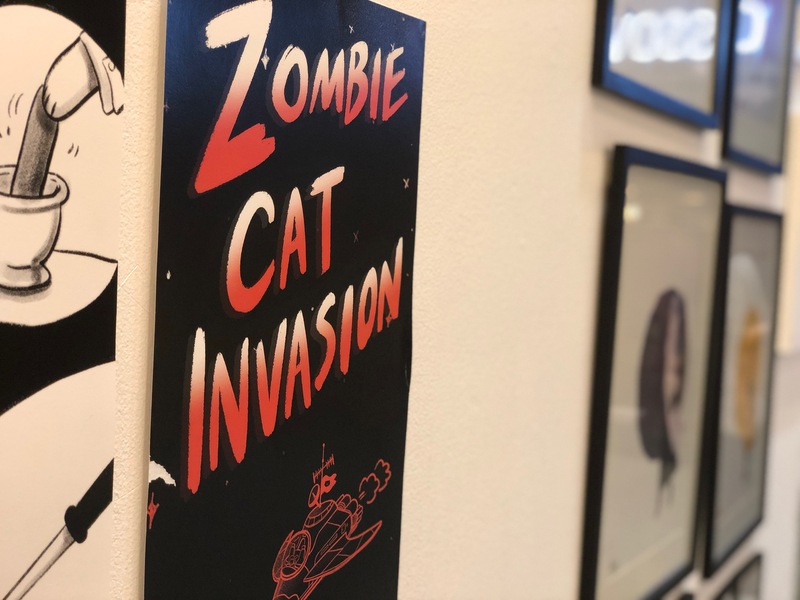 One-time Zombie Cat Invasion merchandise package including - postcards, stickers, buttons, and enamel pins. Wow, thank you all. Really, I mean it. This is such a huge blessing. When I reach 100 patrons, I will buy a new shinier faster MacBook Pro which will improve my workflow.